This Namibia 2012/13 HA was conducted between July 2014 and March 2015. Following the launch workshop in September 2014, the HA team, with representation from the Government of Namibia, the HFG Project, and the World Health Organization (WHO), began primary and secondary data collection. Collected data were then compiled, cleaned, triangulated, and reviewed. Data was imported into the HA Production Tool and mapped to each of the SHA 2011 classifications. The results of the analysis were verified with Ministry of Health and Social Services management at a validation meeting on March 10th, 2015. 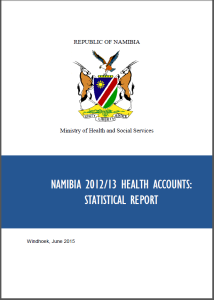 The purpose of the HA exercise was to estimate the amount and flow of health spending in the Namibia health system. In addition to estimating general health expenditures, this analysis also looked closely at spending on priority diseases, the sustainability of financing in light of trends of decreasing donor funding, levels of risk pooling and contributions by private sector, and beneficiaries of health services. For more information on the policy questions driving the estimation as well as a report compiling findings and their policy implications, please see the HA report. This methodological note provides an overview of the System of Health Accounts 2011 framework used for the 2012/13 Health Accounts (HA) estimation. It provides a record of data collection approaches and results, analytical steps taken and assumptions made. This note is intended for government HA practitioners and researchers.